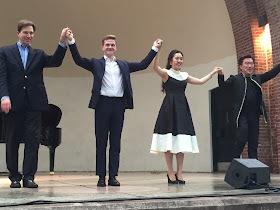 Under each umbrella in Jackie Robinson Park was an opera lover, thrilling to a perfectly chosen program performed by three magnificent voices, accompanied by Dan Saunders on the piano. Everything on the program was a "war horse" but the performances were unique and freshly interpreted. 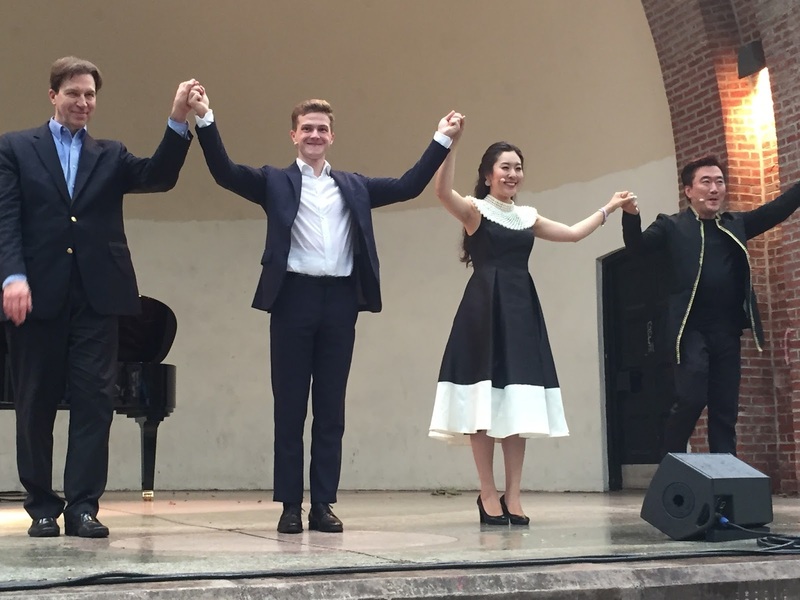 Having a scintillating soprano, a terrific tenor, and a brilliant baritone on hand permitted a splendid selection of arias and duets. The threatening weather might have discouraged some folks from attending but we would risk life and limb, let alone a little rain, to hear three such major talents share their artistry. We brought our own little group to share in the fun and all agreed that it was worth getting wet. No one shrank. No one faded. The threatened thunderstorm did not ruin our pleasure. Good old Thor decided to spare us. We've only heard tenor Petr Nekoranec a couple times but he has made a strong impression on us with the sweet timbre of his instrument, which lends itself beautifully to the bel canto repertory. His technique is flawless and his execution of the challenging showpiece "Ah! Mes amis...Pour mon ame" could not have been better. Aside from his musicality, he has the ability to create a character one cares about. Donizetti's La Fille du Regiment only works when you really want Tonio to win the love of Marie and overcome the obstacles of nationality and social class. Similarly, one must have affection for Nemorino and root for him to win Adina's hand in Donizetti's other delightful comedy L'Elisir d'Amore. Last night, he proved himself to be a superb scene partner with soprano So Young Park in "Caro Elisir! Sei mio!...Esulti pur la barbara" First we laugh at his ignorance as he swigs from the wine bottle and develops "Dutch courage", acting careless and indifferent to Adina. But he has won our heart and we want him to win Adina's as well. When Mr. Nekoranec's Nemorino gets around to singing "Una furtiva lagrima" we are cheering him on and never comparing his performance to anyone else's. The fine vibrato of his voice was effectively employed with a new shade of joyful anticipation. No doubt the stunning arpeggio toward the climax, the subtle portamento, and the carefully modulated dynamics were well thought out but everything sounded organically spontaneous. Nadir's lovesick aria from Act I of Bizet's Les Pecheurs de Perles, "Je crois entendre encore" was sung movingly with fine French phrasing and some floated high notes that seemed to hang in the air for a long time. The final note was spun out into a delicate thread of sound. Incredibly gorgeous! From the same opera, the famous duet "Au fond du temple saint", was performed with the impressive baritone Hyung Yun. It gave the two artists an opportunity to produce harmonies that were beyond beautiful. Moreover, you could accept that Nadir and Zurga were both friends and rivals, thanks to some excellent acting. Mr. Yun impressed us with his versatility. He did justice to the "Toreador Song" from Bizet's Carmen by filling the verses with more subtle variations of color than we usually hear. We liked his interpretation far more than the usual bombastic one. Escamillo became, for us, a real person, not just a rival for Carmen's affection. Just consider how differently he came across in the elegiac "O du, mein holder Abendstern". We never want to hear anyone tell us that German is not a beautiful language! Wagner's exquisite poetry and Mr. Yun's soulful singing drew us into Wolfram's world and made us want to hear Tannhauser again as soon as possible. In yet another demonstration of versatility, he performed "Cortigiani vil razza dannata" from Verdi's Rigoletto. This aria requires the baritone to be vicious at first toward the members of the court who abducted his dear daughter, then to become contrite and beg them for information. We needed no limp or padding on the shoulder to understand the deformed character of the poor hunchbacked court jester. It was a gripping performance. Yet another manifestation of versatility had Mr. Yun enacting the role of Don Giovanni trying to seduce Zerlina in the Mozart opera of the same name. We saw and heard him becoming increasingly forceful until his prey was secured. Another impressive performance to add to the list.! Zerlina was sung by soprano So Young Park who did her best to resist the irresistible. Ms. Park shone in a couple of challenging arias. Adele's "Laughing Song" from Johann Strauss' Die Fledermaus, "Mein Herr Marquis" showed off the singer's bright voice, charming personality, and skilled coloratura technique. Similarly, she was excellent in "Les oiseaux dans la charmille", Olympia's song from Offenbach's Les Contes d'Hoffman. This challenging song requires extraordinary flexibility in the voice combined with rigid mechanical movements of the body. This must be like patting your head and rubbing your stomach simultaneously! Ms. Park was completely convincing. Moreover, she showed an entirely different side of her artistry in Musetta's aria "Quando m'en vo" from Puccini's La Boheme. In this aria, Musetta has to feign indifference to her on-again off-again lover Marcello while letting the audience know that she really wants him back. We loved the way she performed it. After all that very special entertainment, each artist offered an encore in a more popular vein; what we would call American classics. Ms. Park sang "I Could Have Danced All Night" from Lerner and Loew's My Fair Lady in a most winning manner. Mr. Nekoranec sang "Be My Love" and we'd be surprised if there were a woman in the audience not ready to comply! Mr. Yun sang "Some Enchanted Evening" from Rodgers and Hammerstein's South Pacific, and that just about summed up our experience, an enchanted evening indeed. The wonderful arrangements of these songs were created by Dan Saunders who added so much to the evening's success. The Metropolitan Opera must be appreciated for bringing opera to all five boroughs and making it available free of charge. Had this been our first exposure to opera we would have been a convert for life.